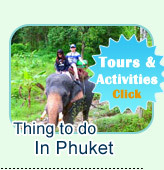 This trip is special designed by Jc.Tour-Phuket.com. 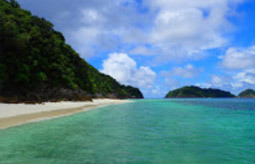 In the reputation of the islands of Myanmar Sea is very high and so beautiful. All the islands are real 100% virgin, bout under the water and on the green land. 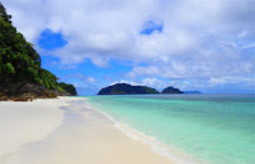 However, to take a trip to visit the islands passing Myanmar Country is quite difficult - the flight is very limited, very strictly for VISA and too long flight from Singapore or Malaysia. 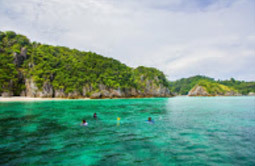 Jc.Tour Phuket had set up the tour trip to visit these most beautiful unseen islands by starting the tour from Phuket with the top level service of Jc.Tour make more easy to touch the new virgin islands of the World. The Reindeer Island: The hidden small island in the Archipelago, do not hope to find the other more beautiful island. The reindeer island .. 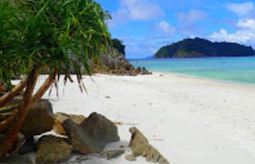 This island is the special reserved island which is hidden amid the 804 islands of Mergui Archipelago of Myanmar. 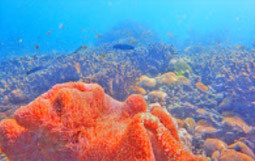 On this island, jc tour stop for do snorkeling. 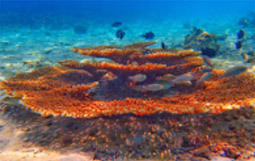 All around of the island is the garden of all species of corals. When you snork here it looks like you walk in the garden, it is just under the water. And the nature both on the island or under the water is 100% virgin. The Cockbern: You will not beleave the pictures by your eyes. The top beautiful of nature. 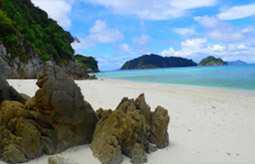 The terrace beach of Cockbern: The sand on the beach is same the "Coffee Mate", so clear and soft. 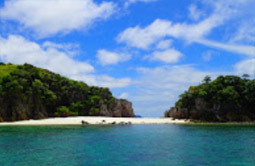 The real white filled sandy beach is cut with the clear water blue sea make you feel so happy and surprise. 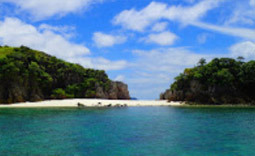 And this island is the private of us, no other tourist groups, Just our group - Not over 35 people per day. It can be called the your private island. 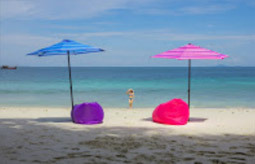 We provided the good beach shade umbrella and air sofa with the cool drinks. Dolphins Bay is the one of 5 bays on Cockbern Island: Next from the terrace bay (Ma Way Way Bay) is the dolphins bay. 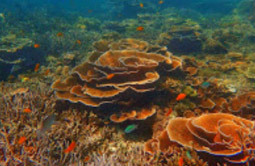 We stop the boat on the beach and every one can do the real heaven beautiful point of snorkeling. 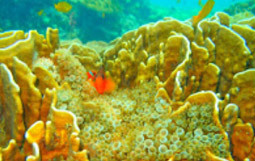 The coral reef with a ton of beautiful fishes can be touched. (by eyes.) You can see all species of beautiful fishes. 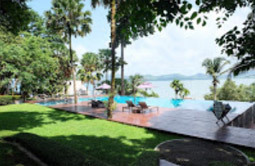 The Blue Sky Resort@ranong can be considered to be the best hotel of this province. 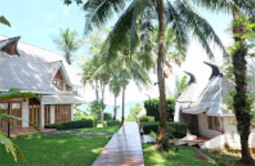 And it is only one as Boutique Style, It is located on the seaside. Nice swimming pool, the room is very nice unique designed by the top designer of Thailand. 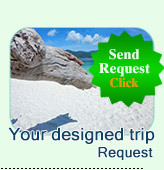 We guarantee that you will be very happy with this overnight on this resort. Programs (2 Days 1 Night.) for every Friday. 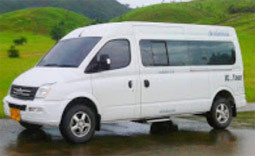 13:00 PM: The minibus of Jc.Tour picks up from every hotel in Phuket or Phuket Airport. And drive to Ranong Province. - Beautiful sightseeing the road sides to Ranong, Stop for a cup of coffee or tea at Kuraburi Green view. - Arrival the Mineral hot spring of Ranong. We service to take a Mineral Bathing for health. 18:00 PM: Check In at "Ranong Blue Sky Resort"
18:30 PM: The private minibus of Jc.Tour picks up for having dinner and nightlight of this Ranong's small Town. 08:30 AM: Leave from the pier at Ranong, Stop for 10 minutes at the Seaside town of Myanmar for stamped in Visa and continue to the Island. 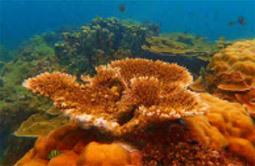 10:00 AM: We arrival the fist point for "Coral Garden under the water" at Reindeer Island. The helping staff arrange about the snorkeling gears and caring the life ring for non-swim people. 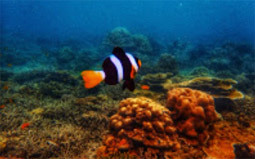 Every people can do the snorkeling for sure. 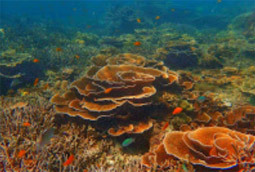 And the beautiful coral reef is unbelievable - So great! 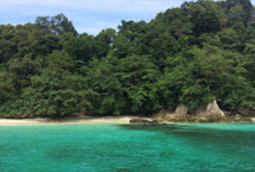 11:30 AM: We arrival "Emerald Heart of Myanmar Island" The boat is floating near the entry, we start to do the snorkeling outside the lagoon first, (There are full of Sea Flowers) And very easy swim pass the panel into the lagoon. 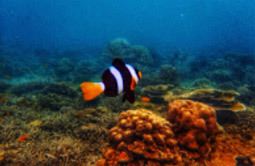 Inside is the village of Nemo Fishes. All area (Yes! 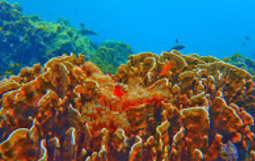 It means all area) is covered by the the soft coral with a thousand kinds of Nemo Fishes. Great! this is the only word you can say after you see it. 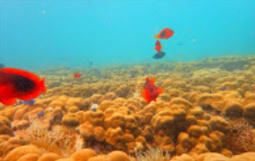 14:00 PM: We take the speed boat to Dolphin Bay: All kinds of coral: Sea Fan Coral, Bean Coral, Balloon Coral, Weed Coral, Brain Coral, Lettuce Coral, Rose Coral etc. 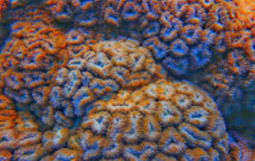 can be seen in the "Coral Garden." 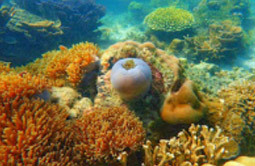 We guarantee that you will never see the large coral reef garden like this before from the other places of the world. 15:00 PM: The boat start to run fast back to Ranong. We stop for other 10 minutes to stamped out the document at Myanmar Seaside Town - Kowthaung. 16:30 PM: Arrival Ranong Pier. 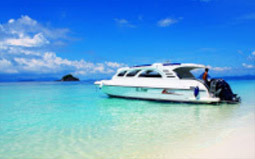 Our minibus picks up from the pier and take you to Dinner at the restaurant in Ranong before directly to Phuket. 22:00 PM: Arrival your hotel at Phuket. One night Accommodation at "Blue Sky Ranong Resort"
Booking: No need to submit the booking, no need any credit card. 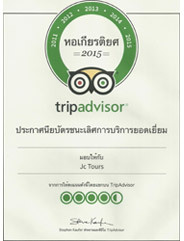 Jctour-Phuket had got the certificate for "Best Service and Reliable Tour Agent" from TripAdvisor, Year 2014 and 2015. For sure that "you will never miss hope with our best service"